Your first Code S and you made it to the Ro8. How do you feel? The ZvPs were difficult but I've gotten closer to my goal of winning the championship so I am happy. In the first match, you grabbed Happy by a score of 2-0. Your Zerglings were moving around pretty smoothly. In order to harass the Terran I ran my lings around. I also wanted to delay his expansions as much as possible by keeping my lings in his vicinity. Did you expect to meet Seed in the winners' match? I saw Symbol win game one so I expected to face him but then Seed made it so that threw me off. Is that why you lost game one against Seed? I had no idea he was going for colossi. I also was unable to prepare spine crawlers in time so I lost. You lost your undefeated streak with the loss in game one against Seed. Were you disappointed? I wasn't even paying attention to that fact so I didn't even know that I was currently undefeated at that time. Going undefeated wasn't even one of my goals so no, I am not disappointed. The audience cheered for your heavily today. Do you also know that you are getting a ton of praise from the fans as well? I saw my coach's twitter so yes, I knew. I felt really good once I found out people were praising my plays. I felt no pressure regarding that. With your Ro8 advancement, you secured your placement for next season's Code S.
I forgot about that. I just kept on focusing at the upcoming match so I didn't realize I had already made it this far. Now that I know, I feel really good. A lot of people have said for a while now that if Life made it to Code S he would do really well. What is the secret to your success? There is no secret really. I think the biggest factor is probably that my coach keeps coming in to my booth to give me advice. Your next opponent will be the person who advances out second in Group C. Who do you want to face? I don't care who i face. I have confidence so it doesn't who makes it because I will win. But I really dislike team kills. If Curious hyung makes it, I really hope he advances out as first in his group. Otherwise, I would prefer if he just got eliminated (laughs). Yesterday, By.Rain advanced out of his group as first. You and By.Rain both are trying to achieve the royal road. What do you think will happen if you face each other? I saw his games yesterday and he was really good. But I still think I would win if we faced off against each other. So your goals for this season must be the championship? That is correct. I really think I am capable of making it to the finals. Didn't you say your goal was the championship? Do you just want to make it to the finals? Well our team has this second place curse going on right now so I think winning the championship is going to be difficult. In fact, just recently I also placed second in an overseas tournament. The most concerning factor this season is not the players I face but this ongoing jinx (laughs). First off, I need to make it to the finals. I am confident. You're being called the LG-IM Code S killer. If you beat Mvp in the Ro8, you will have successfully all killed LG-IM. I think I would have won regardless of who I met. It's not necessarily just LG-IM players. I win against everyone. GSTL begins soon. Do you think you'll win if you're sent out? In my current state I think I can definitely win. I'm sure I can also achieve an all kill but I won't know that till I actually play. PartinG hyung helped me for the second match so he wanted me to mention him in the interview. Since he helped me, I will mention him. I want to thank all the fans for coming to the studio and cheering. Lastly, I want to thank our sponsors Red Bull, BenQ, ZOWIE, and Joy Gear. 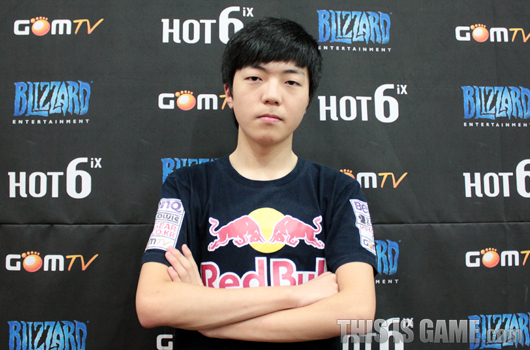 You fought till the end and made it in to the Ro8 of Code S. How do you feel? I said I would in the group nominations so I wanted to make it no matter what. I felt like everything was getting darker after I lost the first match but I was able to make it like this so I am relieved. In the first match, you allowed Seed to make a comeback and you lost by a score of 1-2. You must have remember the Ro8 match from last season's Code S.
In terms of skill, I felt like Seed was superior than me at that time. His builds were good. Honestly, I really hadn't acknowledged that defeat from last season. I told myself that I lost because I got overconfident but with today's loss, I finally acknowledged that he was just better than me. You also seemed pretty shaky during the losers' match against Happy. While preparing for today's matches I focused heavily on ZvPs. I had builds prepared for ZvTs but I didn't really take the time to practice them so I struggled. Against Seed in the final match, you lost game one. I really thought Seed would execute the same build order. So I did a build order to counter that build order but then I ended up taking way too much damage in the early game. You showed a very impressive play when you managed to keep your corruptors alive even though they fell in to Seed's mothership vortex. What was the secret? If you aim your corruptors to target down your opponent's mothership, then your opponent has no choice but to use his vortex. The key is not drag and click the corruptors after they come out of the vortex. Instead, you hotkey them and click them away quickly. They have a lot of health so they don't die to archons that easily. The fans came up with that name so I don't think it's bad. But I don't think I'm quite there yet. But as a gamer, it's always good to have a rivalry develop. You can play a lot of games and increase your skills with a rival. Was your honey-water ceremony a planned one? That is correct. I wanted to do that ceremony after the first match but I couldn't because I lost. With today's victory, the flames seem to have died down a bit (laughs). Next time. if Seed does an even bigger ceremony that I'll do one as well. Anyone specific you would like to face in the Ro8? I don't really have a player I want to face but I do want to play a Terran player like MKP or Mvp. If I want to grab the championship, I need to take down the strongest players. I'm confident against them so I want to be able to play some real cutthroat games. Did you watch By.Rain's matches yesterday? If you both win in the Ro8, you could face each other in the semis. He is really good. If we do meet, I wouldn't necessarily say that I would lose right away, but I will say that it will be important that I keep my guard up and prepare extensively. I want to thank inori and Cyrano for helping me with practice. Today, Seed came up to me and said hi to me. Even though he was being courteous I still ended up doing a ceremony on him. I feel bad about it now. I want to let him know that I'm sorry and that I hope the next time we meet, we once again put on a great show. I hope we can get along with each other. I also want to say that I'm sorry to Happy. (괜히 고래싸움에 새우등 터진 것 같다? This literally translates in to: "I think I burst opened a shrimp during a whales' fight.) Lastly, I want to say that I plan on winning this season's Ro8 match so that I can achieve my dream of winning the championship that I was denied last season. It's so true, Startale has a second place curse. I hope Life, Curious or Squirtle can break that curse this season. I'd say Life is the best performing Zerg in Korea atm. Dat Queen burrow micro wack-a-mole style against Seed LOL! edit/ Cant wait for Symbols interview...I bet he must be feeling so relieved after getting his vengeance. Here's what I never understood about that. Why is it spelled LimJinRok? What does Rok stand for? Feels like they're a lot better player rivalries this year for the award at the end of the year. Seed vs. Symbol, Polt vs. Stephano, MKP vs. Parting, and a few more I'm probably missing. I hope Symbol really did say something about a whale fight. I knew about the Lim and Jin part. I want to know why is it spelled Rok? Rok is not even an actual word. And if it's short for records, then shouldn't it be spelled Roc? Also, what does LimJinRecords mean? 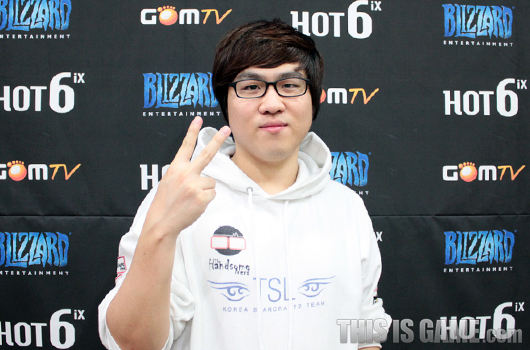 If Mvp doesn't win his fifth title, we'll have the 10th GSL champion of all-time this season. I dont know the reason why <.< You should ask to other translators. Thats what i learned from other TL translators. Shut your dirty mouth! Nobody ever stumbled their way into a championship.